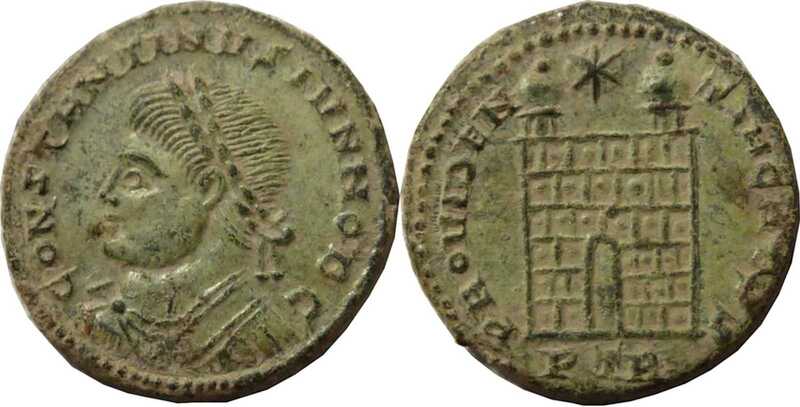 CONSTANTINVSIVNNOBC [CONSTANITINVS IVN NOB C]; bust l., laur., dr., cuir. PROVIDEN-TIACAESS [PROVIDENTIA (sic!) CAESS]; camp gate with two turrets, no doors, star above. PTR in exergue. UNLISTED REVERSE LEGEND, ENGRAVER'S ERROR. Specimen similar to TRIER 455 except for PROVIDENTIA instead of PROVIDENTIAE in rev. legend. Apparently an engraver's error. From NVMMVS BIBLE II (NBD no. 11469).